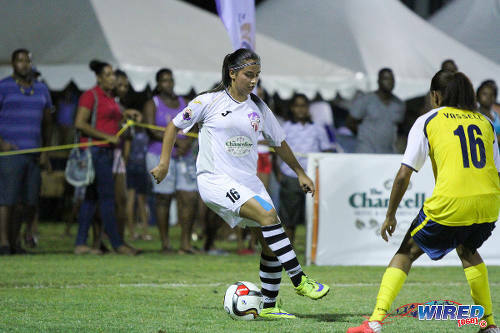 Boom Champions Fuego brought more than just the ‘boom’ to overcome the Chancellor Angels by a 2-1 margin in their Women’s Premier League (WPL) match last night at the Northern Recreation Ground in Diego Martin. Photo: Fuego players celebrate Anastasia Prescott’s decisive WPL goal against Angels in Diego Martin. The Tasha St Louis-led team brought fight, grit, spirit, desire and some more fight to a contest which saw long time Trinidad and Tobago international teammates St Louis and Maylee Attin-Johnson go head-to-head. At the end of 90 minutes of intense and bruising, if not beautiful football action, the Angels had lost one player through ejection and another through injury, and of course they lost the game to boot. Angels and Fuego scored a combined eight goals between them on the opening day of WPL action, some two weeks ago, but last night’s encounter never had such attacking appeal. Not in terms of goalmouth attacks anyway. 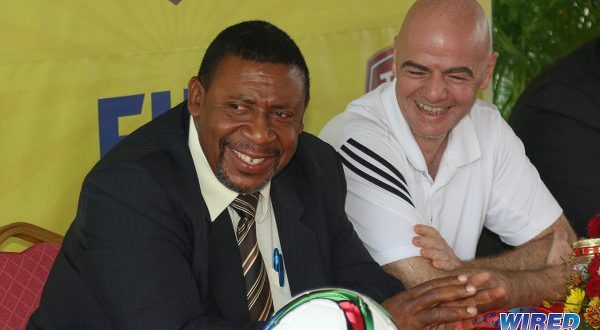 But there was plenty rough stuff, virtually from kick off, as Jamaican midfielder Peta Gaye Soman was sent sprawling in only the first minute. 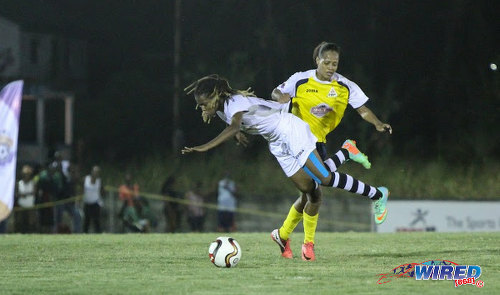 Photo: Angels attacker Kandace Franklin (left) is taken out by a Fuego defender during WPL action last night in Diego Martin. Angels skipper Attin-Johnson could have opened the scoring in the sixth minute but her lobbed effort went agonizingly wide of a relieved Leticia “Lele” Bussato’s goal. Fuego’s Brazilian custodian was called into action, just a few minutes later, as she denied Angels’ Jaclyn Poucel and Kandace Franklin in separate incidents. First, she made a strong save to deny a Poucel header off a set piece delivery in the ninth minute and then, a minute later, she ran off her line smartly to deny Franklin of what looked like a certain goal. 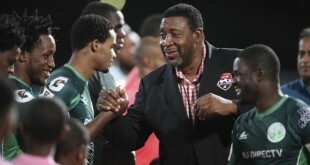 The Angels were exploiting Fuego’s lacklustre start and the speedy Franklin caused more panic in the Fuego penalty area in the 19th minute before being unceremoniously hauled down by left-back Tanesia Vassell. 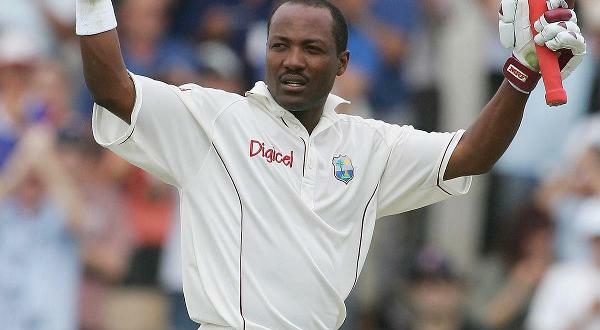 Vassell, who was beaten for pace, pleaded with referee Crystal Sobers but the penalty call was inevitable. 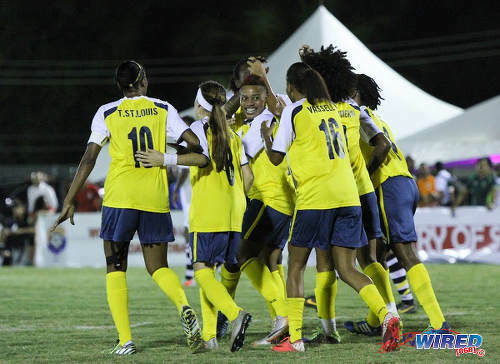 Jamaican midfielder Jodi-Ann McGregor duly stepped up and slotted away the penalty to the delight of her angelic teammates. Now midway through the first half, there was no great rhythm to the game. But the Angels were marginally better. That slight control all but left the Angels from the 26th minute onwards as Fuego pegged their way back into the game. Photo: Fuego attacker Shanelle Warrick (right) prepares to cross while Angels midfielder Tamar Watson (centre) and referee Crystal Sobers try to keep up with the action. 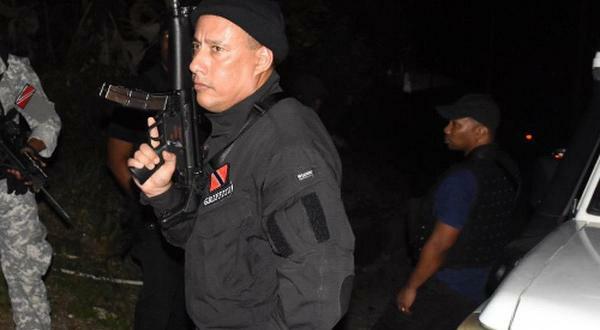 The burly Shanelle Warrick may not have the fleetest of feet but she does possess a wicked set piece, which Angels custodian Tynetta Mckoy and her back line discovered last night. Brazilian defender Ermelinda “Linda” Pantaleao was the first to benefit from Warrick’s precise set pieces as she headed in comfortably at the near post to equalise in the 26th minute. And her defensive partner, Anastasia Prescott, was next as she clinically slotted home from inside the penalty area after Angels failed to clear a Warrick corner in the 31st minute. 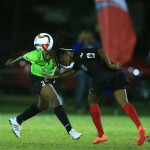 Warrick was not bad as a peacemaker either as she tried her best to calm feisty “Women Soca Warriors” captain Attin-Johnson, who was far from pleased with the tackling of Fuego’s Brazilian attacker, Camila “Kamilinha” Demezio. 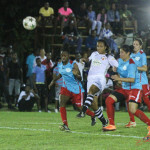 The contest was now heating up, as a midfield battle raged between the Fuego’s trio of Christina Murray, St Louis and Warrick and their Angels counterparts, Tamar Watson, Soman and McGregor. As her team trailed at the interval, Attin-Johnson dropped into the midfield, at the start of the second half, to help Angels recapture their early momentum. 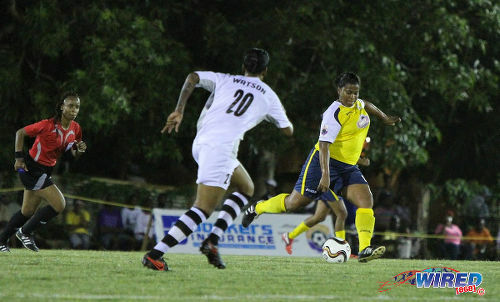 Photo: Angels attacker Vargas (left) takes on Fuego left back Tanesia Vassell during WPL action. But that job was made more difficult when striker Rafaela “Vargas” De Vargas was sent off for her second bookable offence. Vargas was never shy to show off her silky moves to the crowd but in the 64th minute she paid for her over-indulgence. After a failed “sombrero” attempt on Vassell, Vargas pulled the defender to the ground and Sobers responded by flashing a second yellow card at the Angels attacker. Vargas’ first yellow had come for encroaching on a harmless Fuego free kick in the first half. Attin-Johnson dropped even deeper as a result. Both teams tired considerably towards the end of the contest and the 10-woman Angels outfit was crying out for a miracle. 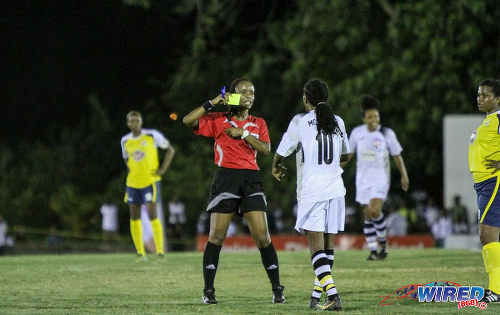 Photo: Angels captain Maylee Attin-Johnson (left) and Fuego skipper Tasha St Louis (centre) vie for referee Crystal Sobers’ attention in WPL action. Would Attin-Johnson or McGregor deliver them from the Fuego shackle? Composed centre-half, Poucel, tried her luck for Angels from long range at one point. But she found Lele to be a worthy opponent in goal. Things went from bad to worse for the Angels when their Kittitian goalkeeper, McKoy, was stretchered off the field with an apparent concussion following a collision with an opponent player. It was the second successive fixture that McKoy failed to last the 90 minutes. The lengthy stoppage seemed to distract Fuego unit. But, luckily for them, Sobers also appeared to lose her bearings, as she halted a promising a promising Angels attack to allow a Fuego player to be treated for cramp. The shorthanded Angels threw all they had at Lele, in the dying moments, but the custodian would not be beaten from open play. 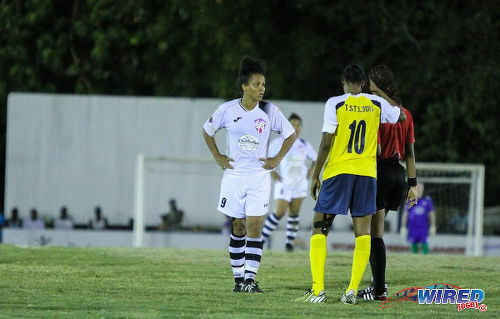 Photo: Referee Crystal Sobers (centre) prepares to caution Angels midfielder Jodi-Ann McGregor. 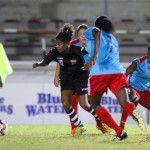 Angels’ wily Vincentian winger Franklin had one last crack at the cherry in the fifth minute of stoppage time but the watchful Lele fended away her long range free kick. It assured Fuego of three points and a place atop the WPL standings. Boom Champions Fuego (4-2-1-3): 1.Lele (GK); 15.Patrice Superville, 4.Linda, 3.Anastasia Prescott, 16.Tanesia Vassell; 10.Tasha St Louis (captain), 11.Christina Murray; 9.Shanelle Warrick (18.Denisha Thomas 76); 5.Jamila Matlin (14.Claudia Saucedo 69), 12.Jo Marie Lewis (7.Zaudita Kaza-Amlak 88), 8.Kamilinha. Unused Substitutes: 21.Priscilla Tapia Castillo (GK), 2.Diamond Henderson, 6.Nickisha James. Chancellor Angels (4-2-1-3): 1.Tynetta McKoy (GK) (25.Beth Seman 84); 6.Alyssa Bodhoo, 2.Ayanna Russell, 8. Jaclyn Poucel, 4.Jodie Redgrave; 7.Peta Gaye Soman, 20.Tamar Watson (13.Bruna Da Silva 84); 10.Jodi Ann McGregor; 15.Kandace Franklin, 9.Maylee Attin-Johnson (captain), 16.Vargas [red card 64]. Unused Substitutes: 3.Tkeyah Phillip, 17.Sharain Cummings. 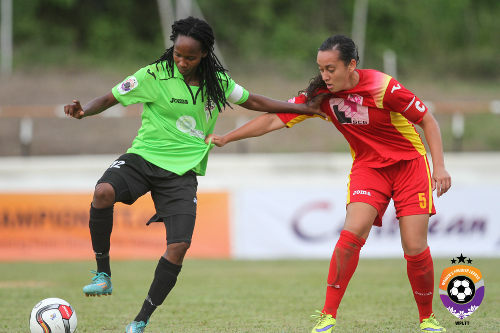 Photo: Rush captain Ahkeela Mollon (left) tries to hold off Dragons captain Arin King during WPL action in Palo Seco. Player of the Match: Leticia “Lele” Bussato (Fuego). CNGC Rush v Wave FC, 8 pm, Ojoe Road, Sangre Grande. This was the same vision that Arthur Suite had when he started his pro league in PSA grounds Long Circular opposite the Mall back in the days and then if it had continued to move it to the other communities so that each community will have their own team and will then have mucho crowd support I really like what is going on with the WPL and it should only get better.